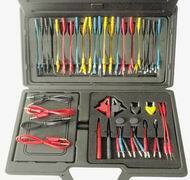 A perfect wiring circuit checking tool. in checking the car problems accurately. to vehicle ECU to avoid unnecessary new parts replacement. valve of transmission shift gears and control signals. for most European, American and Japanese made terminals.